Veteran Grace Brethren missionary to Africa Ruth Snyder, 88, pictured here with her husband, Roy, late this afternoon went to be with the Lord from her home at Grace Village Retirement Center in Winona Lake, Indiana. 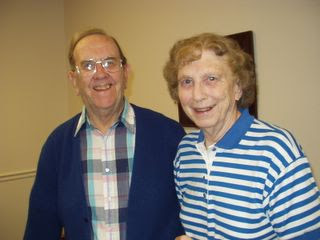 Ruth and Roy have been married 61 years and were faithful members of Winona Lake Grace Brethren Church in retirement. Roy has for many years produced a newsletter for and about retired GBIM missionaries. The Snyders served in the Central African Republic until 1983. Tentative plans call for visitation Friday evening and a memorial service Saturday afternoon.